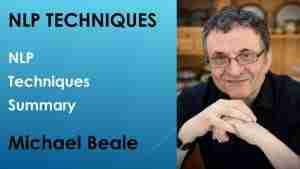 In this video, Michael explains how NLP will help you become more effective. This section on NLP techniques has given us some very powerful tools. NLP provides a richer and more powerful model than the GROW model used in coaching and business. In addition we have a raft of extra approaches to help both ourselves and our clients achieve what they want. In any journey,it helps to know where we’re going and where we’ve been. We do this through establishing end goals and current position. There may be a challenge in that many clients think they know what they want and where they are. There is often have a blind spot to exploring these further. The problem is that our chance of success drops off rapidly if we don’t have a good fix on either of these positions. So our working model is that we push just a little bit further than is polite. We’ll all benefit in the end. Before starting any intervention it’s worth setting a beginning frame to establish ground rules and expectations. If either we or our client isn’t in a useful state it’s not effective to set end goals, plan, take action or review. It’s therefore worth doing whatever we need to do to ensure we and our clients are in the best state for what we want to do. Rapport helps us open a two way communication channel with our client. The simplest way to open up communication is to focus on what we have in common and genuinely work on what’s important to them. However, as part of this, it’s useful to have their agreement that we’ll always be straight with them. While we’ll always focus on solutions, we won’t shy away from facing and tackling difficult issues. Future pacing helps us take action with the first step in the journey. Once we’ve taken that step, it’s much easier to move faster. If we’ve achieved all the above we’re in a really good position to help them. In the next section we look at NLP in Business, and how to succeed in business.